A California boy, 11, just graduated from college with three degrees. 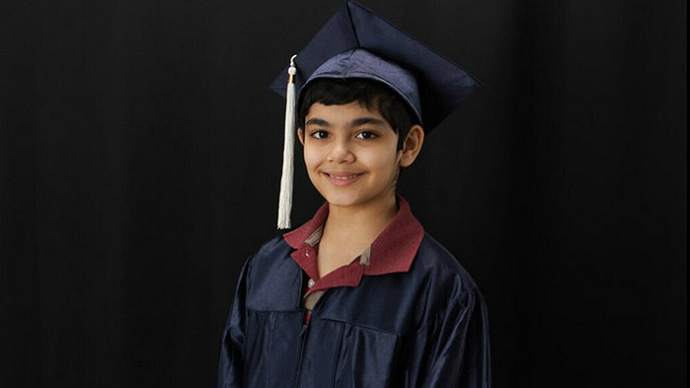 Tanishq Abraham says his dreams are to become a doctor, a Nobel Prize-winning medical researcher, and President of the United States. Abraham graduated from American River College in Sacramento, possibly the youngest graduate in the college’s 60-year history. Tanishq was home-schooled by his mother Taji, a veterinarian who reportedly took a break from her own PhD studies to teach him. Last year, at age 10, he satisfied all the state requirements and graduated high school. Intellect apparently runs in the family. His father, Bijou Abraham, had a perfect math score on his SAT. He is a Cornell University graduate and software engineer. Tanishq’s younger sister Tiara, 9, is also a prodigy; both children joined Mensa International at the age of four. Tanishq started taking classes at American River College when he was 7. According to KNTV, he had enough credits for associate’s degrees in mathematics and physical science, general science and language studies. The boy’s summer plans include taking an eight-week Calculus II course, and a family vacation. His long-term goals include attending Stanford University, becoming a doctor, winning a Nobel Prize in medicine, and becoming President of the United States.